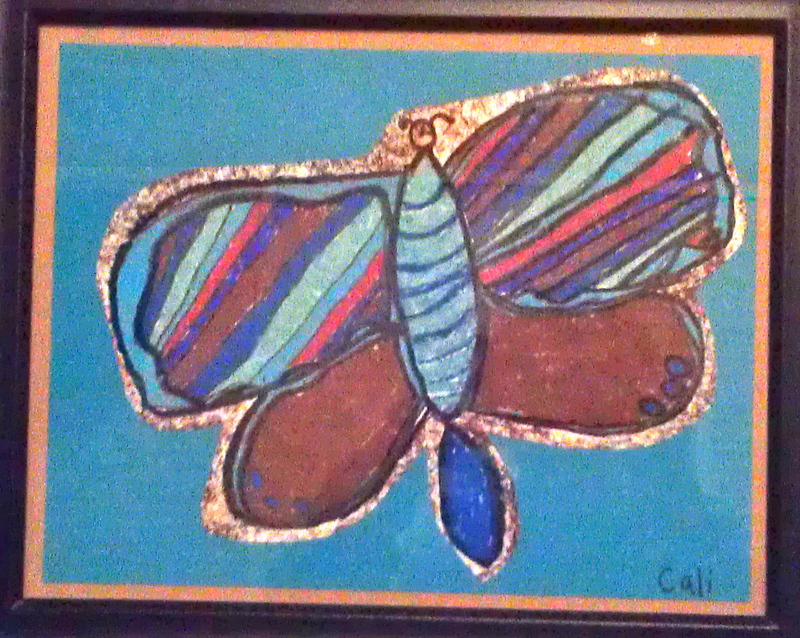 I love my kids’ artwork…I myself have never been very creative or artsy. When I was younger, I do remember enjoying my art classes at school…and once in awhile my mom or dad would say I seemed to have a knack for it like my Grandpa Nelson did (I never knew him b/c he died of a heart attack at 45 yrs. when my dad was 7). I’m sure they were just being kind, but it made me feel connected to my grandpa. 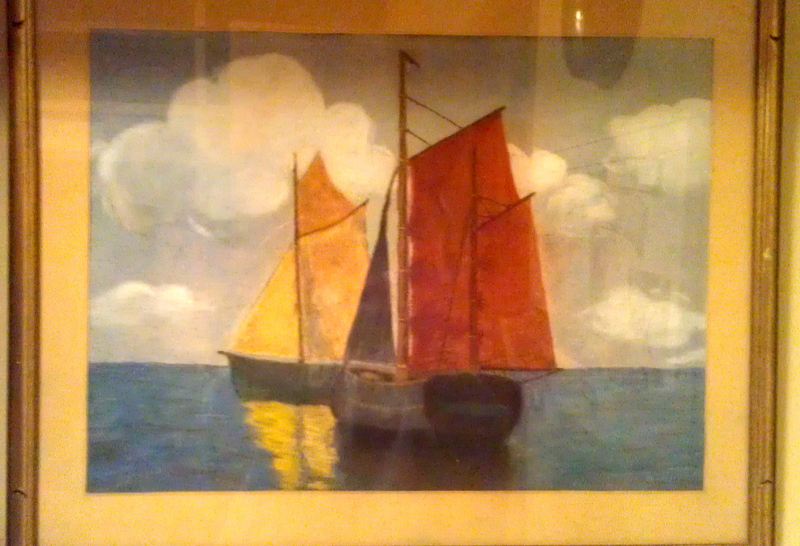 Here’s a watercolor painting he did that my dad gave me and it hangs in our mud room. I love it. I remember going through a calligraphy phase in late middle school. My mom bought me a cool set and I practiced a lot on my special paper with all the different colored pens…some had thicker tips and some were more thin. Then, there was the candle making stage… pressing my fragile sea shells I had bought at an airport gift shop into the warm waxed cylinder I had formed somehow in the hot water on the stove. I think that season was sandwiched around my stamp collecting (also passed on from my dad’s side). Oh yeah…somewhere in there I collected coins, too. I think I sold those in a garage sale (just kidding, mom and dad)… anyway…enough reminiscing about me! Since kids rarely get art anymore in school these days, and because I didn’t do art projects with my kids (unless you count dot paints, play dough, and pearler beads), I would sometimes send them off to my friend’s house for “Alicia’s Art Camp” where they have made lots of hang-on-the-wall-worthy stuff! See the butterfly and the owl for 2 examples. Could you bust at Will’s self portrait? The freckles…ah… so cute. BUT WAIT! 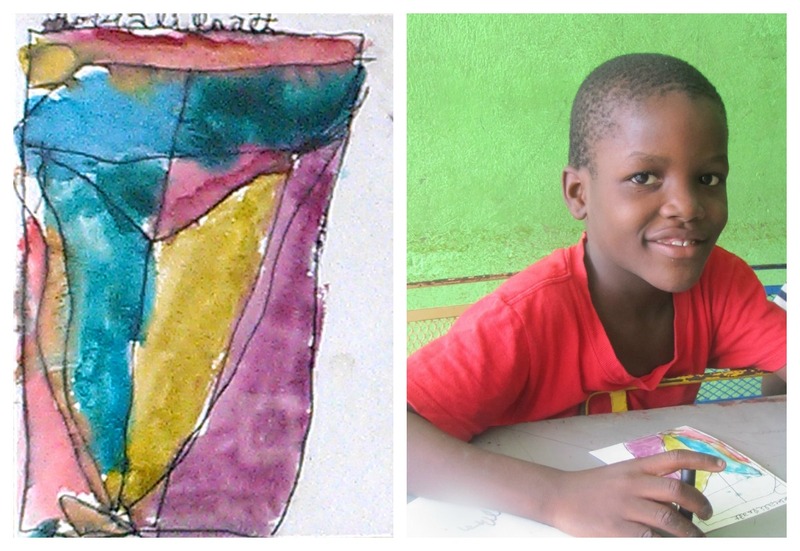 He WILL have some art work…on OUR wall! My sweet friend, Sara, gave me the greatest birthday gift…(no offense to other gift givers and don’t let this deter you in the future). It’s an art project that she did with the boys while visiting the orphanage in December 2011! How cool is that? Up at the top you can see his neatly written name in cursive (along with his last name, Chovet). And, there’s the picture of him working on it! I can’t remember why she ended up bringing it home with her, but I’m sure glad she did…and who could’ve guessed she’d end up giving it to me! On the adoption process: a lot and nothing has been going on. A lot in the Haitian Government/IBESR…and nothing in our case. Haiti has just within the past 2 weeks released a list of new rules back dated to Nov. 5, 2012 and 19 U.S. agencies that they will proceed to work with on new cases. Ours will be considered new because our dossier has yet to be accepted into IBESR and our agency is not on the approved list. We’ve had a few back and forth emails and phone calls within the past 24 hours with our case worker in Montana. They have started working to figure out what this means for them and for us over the next few days. They will formulate a backup plan if need be to keep our cases moving (or really to start them moving in Haiti)…currently ours and the Haroldson dossiers are sitting on the lawyer’s desk there waiting for how to proceed and for some other documents they need to provide on their end. Last fall, we knew something like this could happen and we knew that a lot would be up in the air for awhile during the changing Haitian adoption laws. Part of the new procedures is that the U.S. has been given a quota of how many kids will be allowed to be adopted out of Haiti per year (this is common among all countries who do adoptions). Then, each agency on the list also has a quota of how many kids will be able to be submitted for adoption per month. They say that this can change in the future but it is what they are starting with. We have read on other agency’s blogs that each approved agency will be allowed to submit one dossier per month. That’s not many kids if you are doing the math…and there are a lot of kids in orphanges all around the country that families are hoping to adopt. I heard a song on the radio last night- not sure the name, not sure the artist…but the words I heard were exactly what I needed…”the same God who brought you in is the same God who will lead you out… so leave all your fear and doubt…” there was much more but I was driving and that’s all I remember. So, if you are a “prayer” (and even if you’re not usually! )…we ask tonight for specific prayers for discernment and some concrete answers from our agency next week..then, for a God-inspired backup plan to get those boys to Minnesota!! THANK YOU!! Love you all. Couldn’t walk this journey with you… seriously.